Magic blue hack is Free mobile Bluetooth hacking software developed for j2me(Java S40) based handsets. By using this Software You can Hack and Gain almost full acess of victim's Mobile. hack you can gain almost full control over the victim phone. To connect to the other phone you need to run magic blue hack and search for the devices. Then select the target device you want to hack. Whats really sad about this application is that it asks the victim to accept the incoming connection, so it’s not really a hack in true sense of the word. You can even make phone calls; put the call on hold or hang of the phone. Just enter the phone number you need to call and press the call button. To send sms just enter the phone number of the person you want to send sms and write your text in the text box and then click the send message button. The charges for sending the sms will deducted from the hacked device. 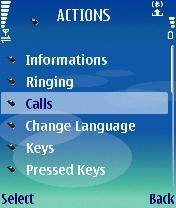 Reading the phone book of the victim phone is also very easy but in some phones specially symbian, this feature is not working correctly and the new release of magicbluehack may solve this problem. Despite being the intruder of privacy magic blue hack can't exactly be called as a hacking software as there is need for the victim to accept the incoming connection but hacking means bypassing the security parameters and sneak into the device without the owner even knowing about it. It should rather be put as toy software rather than hacking software.